Spring is here!! Although it doesn’t quite feel like it in Melbourne, there’s been glimpses of sunshine and warmer weather on the horizon! What better way to celebrate by helping our little pollinating friends! Last week I shared a #meetthemaker #fridayintroductions to introduce myself to all my followers and share a little about me, the artist behind the drawings! This photo was taken from a shoot last week in my studio for an upcoming publication coming out later in the year! A little exciting!! Hiya! 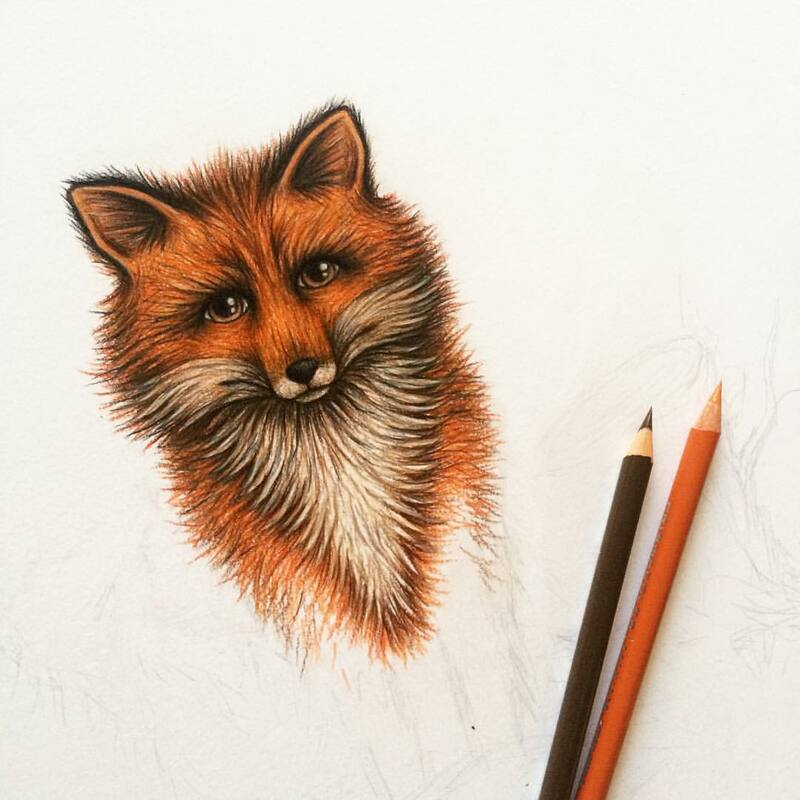 I’m Stacey an Artist and Illustrator based in Melbourne. I’m originally from a lil beach town on the Sunshine Coast in Queensland. Whilst juggling my small business, I also work as a full time Graphic Designer creating vector illustrations, branding and website design. I’m lucky enough to have best of both worlds with my love of modern design combined with traditional mediums through my artwork. I’ve always been passionate about art and have been creating since before I can remember… I was even nicknamed “crafty” in preschool haha! When I’m not drawing I’m most likely making something, whether it be crocheting, macrame or sewing. I love a good cuppa, tinkering around in my studio and absolutely adore cats! I’m also a little obsessed with homewares and indoor plants (you may have seen on my story) I love making a space a home! I enjoy reading whimsical novels, watching Disney films and listening to Fleetwood Mac on repeat. I love the outdoors, going to the beach and forest walks, where I get most of my inspiration. I hope that gives you a little insight about me! Feel free to ask me anything! This little woodland robin is inspired by a little something I wrote recently about taking some time out to myself and actively finding things that inspire me. I’m always so inspired by nature and wildlife, which I’m sure is pretty obvious throughout my work. I have been particularily drawn to small birds recently and have always wanted to draw a little robin. So that was the notion behind this piece – to draw something that I’ve always wanted to. Other things that I’ve been doing that inspire me include crocheting, gardening and caring for my indoor plant babies, spending time in book shops and libraries, visiting galleries, reading more and spending more time writing on my blog. If I’m ever feeling a little uninspired in the studio I tend to go for a walk and get back to nature. I make sure I stop and really soak up all the details; vines creeping up tree’s, mushrooms hidden under logs and all the little critters flying from one flower bud to the other. What do you do that inspires you? Is there something you enjoy that you’ve neglected lately? What do you do to feel inspired? So you may have noticed I’ve been a little quiet on here recently. The last few weeks I have felt really uninspired and unmotivated. Which has been hard for me to pin point, as I’ve never experienced this before in all my years creating. To be perfectly honest it’s a bit of a shock because I’m usually so easily inspired. I think it’s definitely something that’s important to recognise and talk about, as I’m sure I’m neither the first nor the last artist to experience this lack of motivation at some stage in their art career. After all, a lot of us are a one girl band, doing everything ourselves from sending off orders, packaging, accounting, showcasing, promoting. Then finding time to create amongst all the craziness, that it’s no wonder we sometimes run out of juice. Especially when life catches up with us. For me, I think it’s a number of things, that got me asking a few questions. Perhaps I’m not spending enough time creating? Am I feeling overwhelmed? Do I need to branch out with a new medium? Or maybe it’s more personal? The complications with my physical health and the grief of loosing a loved one have caught up with me. Regardless of the cause, I believe the most important step for anyone else out there experiencing this also, is to take this time to work on some self-care. Which is exactly what I’ve been doing the last few weeks. By taking some time out, working on some self-love and finding activities that inspire me. That is what has inspired this piece. To create something for myself, for no particular reason or goal, just because. To have some me time, to reflect and remember why I love doing what I do. It has certainly helped me reading and listening to other artists experiencing this themselves and understanding that it’s okay. That it happens to the best of us. So I ask you, if you’ve experienced this too, to please share and add your experiences. I’d love to hear what you do to feel inspired? 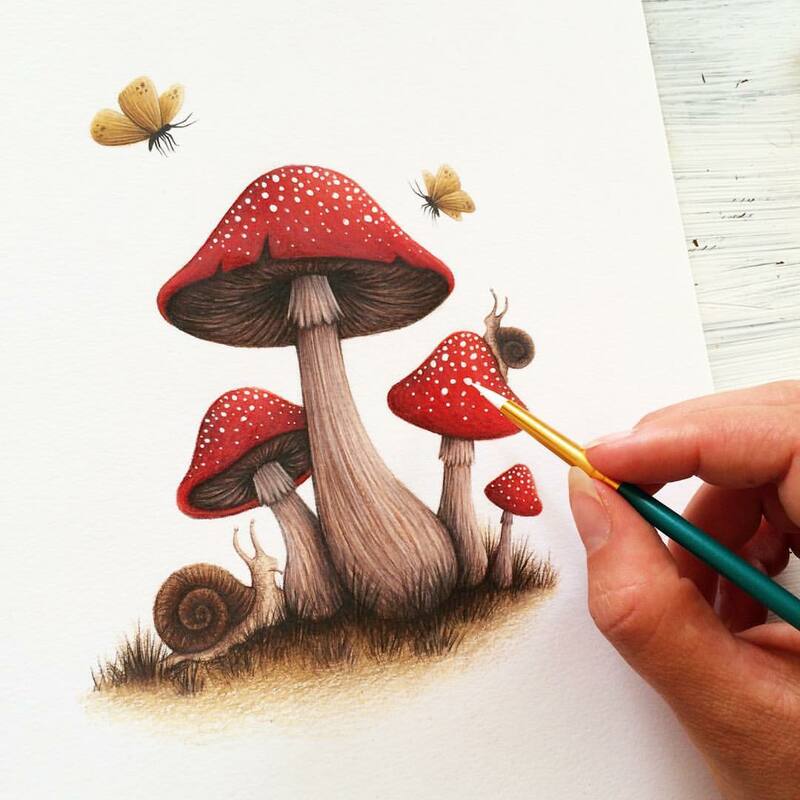 The ‘Forest of Mushrooms’ series captures a wildwood full of growth, minute life forms and woodland creatures comprised in a palette of warm autumn tones. The series explores undergrowths of mushroom species and invertebrates, focusing on minuscule details of life that forms within ecosystems. ‘Wildwood’ was the first edition to the series and was inspired by majestic owls and the change in seasons. The focus wasn’t primarily on the owl as such, but the clusters of mushroom growths and dainty insects. Which initiated the second edition to the series ‘Toadstools’ a smaller study of amanita mushroom clusters and invertebrates. ‘Fox & Fungi’ was another adaptation of ‘Wildwood’ depicting a vixen fox and her cub, exploring undergrowths of fungi on a stump and branches. The vixen is dominant in the foreground as a protector of her offspring and the forest. 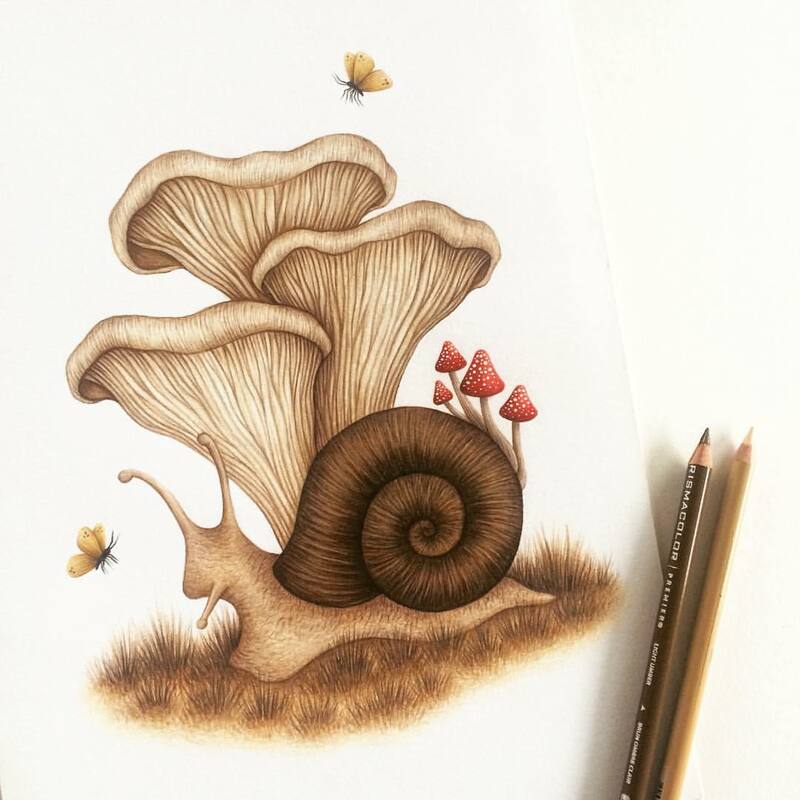 The forth edition was inspired by smaller studies of chanterelle mushroom growths and large snails. The concept behind the series was to illuminate the significance of all life forms from large wildlife to microscopic invertebrates and fungi that uphold vital roles within ecosystems. Fungi are highly diverse organisms that play various ecological roles in the biosphere. They are essential in the recycling of nutrients, decomposing organic matter, symbionts of animals and plant growth, natural enemies of pests, a food source and bioremediation agents. Coupled with fungi, invertebrates also serve a crucial role in the pollination of plants, decomposition and nutrient release. Making up 95 percent of all animal species on earth and are plants biggest source of biodiversity. The fungi kingdom and invertebrate population are crucial, without whom the whole ecological system would collapse. I’m currently overseas and therefore my online store is closed! But never fear, my shop will reopen in November upon my return, full with new prints! In the meantime you can follow along my travels across europe via my instagram staceymaree_art where I’ll be posting a few of my favourite places and I’m sure a few sketches whilst on the road! For all urgent enquiries feel free to contact me directly via email – staceymaree@mail.com Please be aware that there may be delays in response times as I’ll be on the road with limited internet access. Melbourne folk! I have an upcoming exhibition at Brunswick Street Gallery in Fitzroy! I’ll be part of this group show along side some very talented creatives! Opening night is the 21 April at 6pm, so be sure to come say hello and enjoy some drinks and nibbles! I’ll be showcasing a large body of work as well as some of my newest pieces for an upcoming series ‘Forest of Mushrooms’. The series captures a wildwood full of growth, minute life forms and woodland creatures comprised in a palette of warm autumn tones. The series explores undergrowths of mushroom species and invertebrates, focusing on minuscule details of life that form ecosystems within a larger environment. The exhibition runs from the 21 April to 4 May 2017. The Contemporary Localised Survey is an ongoing series at Brunswick Street Gallery, interested in the artistic practices and happenings of today. The exhibition gathers small groups of artists, allowing nuances, juxtapositions and connections to organically emerge from the physical proximity of the differing works. I primarily use traditional mediums of graphite and coloured pencil as well as inks, watercolour and acrylic paint. My work varies from illustration, painting and printmaking depending on my mood. But for the last few years my resolved works have predominately been illustrations. I’m a self-taught artist and have been drawing since before I can remember. I was nicknamed “Crafty” in preschool, with art being something that has always stuck with me. I completed a Bachelor of Fine Arts in Graphic Design in 2012, with minors in visual art and printmaking at QCA. I’m currently a full time Graphic Designer and creative artist by night! No. I’m not currently taking on any commission or freelance work. I used to, however I found it took away from my personal work too much. I’m flat out keeping up with my own ideas, let alone someone else’s! I also just don’t have the time, being a full time designer, by the time I get to my own work the week is nearly over. No. Mainly because most of my early works started in journals and sketchbooks that has developed from there. My sketchbooks are most precious to me, full of ideas and scribbles that I could never pull apart. It also has to do with the technique I used in the early stages of my career. I would layer ink drawings digitally with layers of colour and mixed mediums to create depth and texture. So the original would be much different to the finished outcome. However, my technique has shifted from this style and has become more finished in the initial drawing. Using primarily coloured pencil with an increase in scale, the works focus on capturing realistic representations. Which means the prints are most representative to the original piece, with only digital enhancements and touch ups for printing purposes. So perhaps I might sell some originals down the track… if my collection keeps growing at this rate! This is a question I get quite frequently. The answer is, simply because I want my artwork to be affordable for everyone. I would much rather people have my work and it go to beautiful new homes of all social statuses, than it only be available to a select few. Why is some of your most recent work not available for purchase? Changing cities, means changing suppliers. I have not been able to source a printer that I’m satisfied with in Melbourne since being here. It is also a time consuming process between sourcing, proofing test prints and colour matching. I also carefully compare the quality of the prints against the original to get them as close as possible. I have either found printers to be too cheap and lack in quality or high quality and too expensive. I cannot justify doubling my prices and selling prints that aren’t affordable. My goal is to constantly work on perfecting my technique and skills. To keep up with my ideas and have a body of work that is full of my imagination. As an artist, I think it is crucial to be able to look back on your portfolio of work and see progression, development and growth. My work isn’t the same as it was five years ago; everyday I’m improving my technique, my skill, my craft. That’s what’s most important to me and that’s how I measure my success. It’s just an added bonus when other people appreciate my work as well!